Taylor signed a training-camp contract with the Fever on Monday. 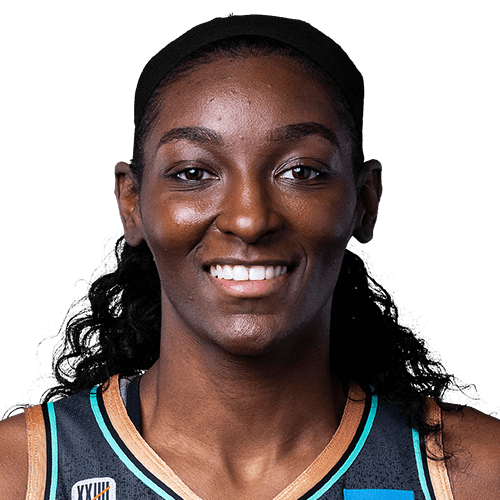 The 6-foot-1 forward had previously signed with the Fever last June and made 14 appearances for the club, averaging 1.9 points and 1.8 rebounds in 8.3 minutes per game. If Taylor is able to parlay her camp deal into a roster spot in 2019, she'll likely be in line for a limited role off the bench. Taylor was waived by the Mystics on Monday. Taylor has played with three different organizations throughout her three-year career thus far, most recently spending the 2017 campaign with the Mystics. In a career-high 24 games last season, Taylor averaged just 1.9 points and 1.8 rebounds across 6.7 minutes. She struggled to play much of a role and has now been deemed expendable. There's a chance Taylor finds some suitors elsewhere following Monday's release, but she'd likely only play a minor role off the bench if a contract is landed with another team. Taylor signed a deal to return to the Mystics on Monday. After playing for Washington during the 2017 season, Taylor is set to return to the club. Last season she averaged 1.9 points, 1.6 rebounds, and 0.4 assists over seven minutes per game. Taylor is averaging 1.2 points, 1.9 rebounds, and 0.4 assists heading into the All-Star break. Taylor is seeing just 6.4 minutes per game and isn't likely to reach double-digit minutes for the remainder of the season, thus she shouldn't be considered much of a fantasy threat. Taylor scored just one point and recorded one steal in seven minutes in Sunday's loss to the Liberty. Seven minutes was the highest total Taylor has played since late June, and this time it was due to Sunday's game being a blowout. Even with Washington being without their two top scorers against the Liberty, Taylor was still unable to see a decent chunk of meaningful minutes. Taylor is yet to serve as a legitimate contributor on a WNBA team in her third season in the league. Taylor (neck) returned to the lineup for Tuesday's 101-89 win over the Wings, going scoreless (0-1 FG) with one rebound and one block across four minutes. Taylor had missed the team's previous outing because of soreness in her neck, but she was given the go ahead to take the court Tuesday after some additional time off for rest. That said, she only ended up playing four minutes and she's largely been just a minor contributor for the Mystics, so she can continue to be avoided in DFS contests. Taylor has averaged just 5.6 minutes per game so far this season. Taylor (neck) has been ruled out for Sunday's matchup against the Dream. It's unclear exactly when Taylor picked up the injury, but she's dealing with some soreness and will look to avoid any further strain by sitting out of Sunday's contest. Taylor will have another couple days off heading into Tuesday's tilt with the Wings, but her availability for that game remains questionable at this point in time. Taylor is just a minor contributor for the Mystics, so her absence isn't really noteworthy for fantasy owners. Taylor is dealing with pain in her neck and is considered questionable for Sunday's game against the Dream, Mike Peden of Summitthoops.com reports. Taylor is averaging just 5.9 minutes per game, so if she's ultimately unable to play, it shouldn't mean any drastic changes elsewhere in the regular rotation. Look for another update to be released at some point closer to tip off Sunday, but if Taylor ends up being held out, her next opportunity to play would be Tuesday against the Wings. 2016 Highlights: Played in 4 games with the Connecticut Sun…tied her career high vs. DAL with 10 points on 9/16. 2014 Highlights: Played in 22 games for the Minnesota Lynx where she averaged 2.7 points and 1.4 rebounds per game. Career Transactions: Drafted by Minnesota in the 3rd round (36th overall) of the 2014 WNBA Draft…Signed by Washington on February 8, 2017. College: 2013-14: Named to the All-American Athletic Conference First Team as well as the conference’s Most Improved Player…Played and started in all 38 games for the Cardinal…Second on the team in scoring (10.8 ppg)…Averaged 10.8 points, a team-leading 7.2 rebounds and 2 assists per game…Shot 49.7% from the field and 75.8% from the free throw line…Averaged third-most minutes on the team (23.4 mpg)…Set career highs against Rutgers on Feb. 23 with 25 points and 15 rebounds…Recorded five double-doubles on the season…Posted a career-high three blocked shots against UConn on Feb. 9. 2012-13: Did not play due to injury, received medical redshirt. 2011-12: Saw action in 32 games, starting 20…Led the team in offensive rebounds with 71…Ranked second on the team in total rebounds with 152…Had the fourth best field goal percentage, connecting on 47.9 percent…Set a career-high with four steals against Kentucky…Dished out a career-high four assists against Seton Hall…Collected a career-high 13 rebounds against St. John’s…Tied a career-high with two blocks against Providence and Seton Hall…Tied a career-high in free throws made with six against Villanova…Tied a career-high in minutes played (34) against Seton Hall…Scored 14 points and grabbed nine rebounds against Villanova…Recorded double-doubles against DePaul with 12 points and 10 rebounds and against St. John’s with 10 points and 13 rebounds…Finished the year averaging 5.6 points and 4.8 rebounds per game. 2010-11: Saw action in 31 games for the Cardinals, starting in 18…Scored a career-high 16 points against Notre Dame…Knocked down a career-high seven field goals against Notre Dame…Pulled down a career-high 12 rebounds against Gonzaga…Collected a career-high three steals against Notre Dame and Villanova…Scored 10 points and pulled down 12 rebounds against Gonzaga for her first career double-double…Scored double figures against Notre Dame and Gonzaga…Finished the season averaging 3.9 points and 3.3 rebounds per game. 2009-10: Saw action in 31 games, starting in 10 games…Earned a spot in the starting lineup in the month of February…Scored a career-high 14 points against Marquette…Pulled down a career-high eight rebounds against Marquette…Blocked a career-high two shots against Tennessee…Scored in double figures in three games…Dished out a career-high three assists against Old Dominion…Finished the season averaging 4.3 points and 2.6 rebounds per game. Personal: Columbus, Ohio native…Birthdate is Aug. 22, 1991…Mother is Felicia Taylor…Major is sports administration…Second team Division 1 Ohio All-State selection her senior year at Whetstone High School after averaging 29.3 points and 17.1 rebounds a game…Member of Whetstone High School’s Hall of Fame…High school’s team MVP all four years. Career Transactions: Drafted by Minnesota in the third round (36th overall) of the 2014 WNBA Draft…Signed by Washington on February 8, 2017.